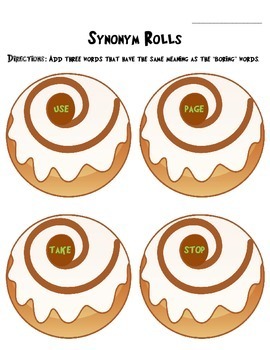 What better way to help students learn about synonyms than to dress up a cinnamon roll with 3 words! 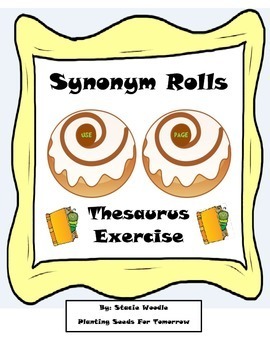 In this activity, students will need a thesaurus. They will independently (or in small groups) look up a word and record three other words that have the same meaning. They will record their findings on the colorful worksheet or the black and white worksheet provided. 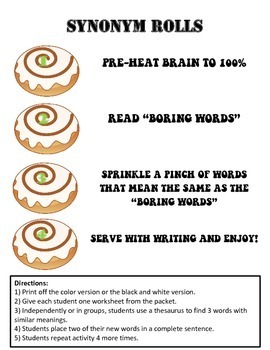 Once students are comfortable with this activity, they can use the blank worksheets to come up with their own words!